I know I was just complaining last week about how the beginning of November is not the Christmas season, so it might seem a bit ironic that I'm now publishing a holiday gift guide, but I got so excited once I had the idea that I just couldn't wait until Thanksgiving! Plus, stores are running holiday promotions earlier and earlier, so I thought putting the gift guide out early could help you strategically take advantage of any promotions running between now and December 24. 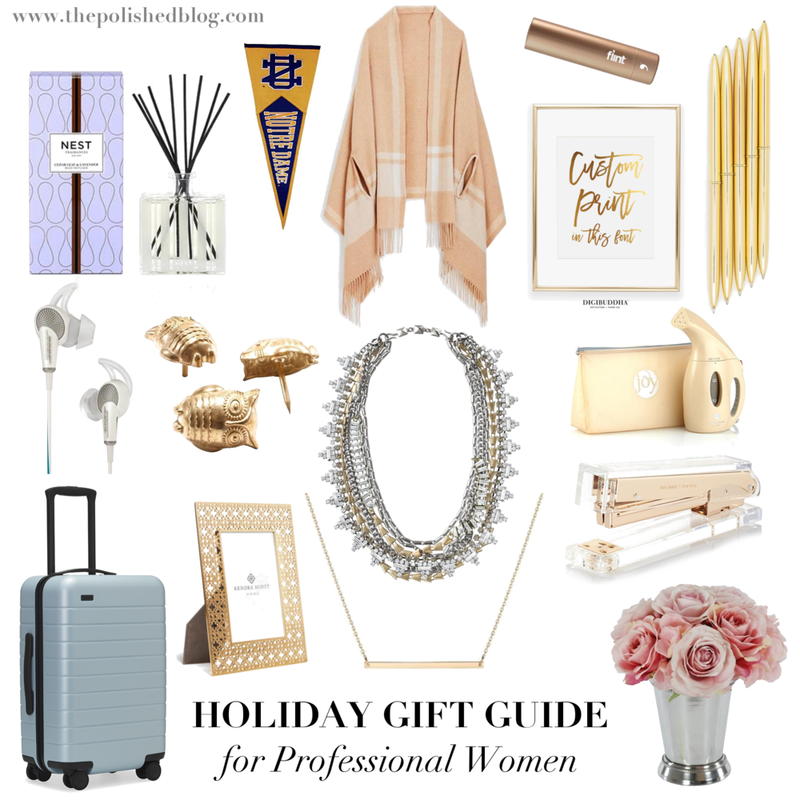 This gift guide is full of suggestions for gifts that will help the hard working professional women (including yourselves!) simplify and beautify their daily lives. These gifts will make the recipient's day-to-day a little more pleasant, whether by saving time, making an annoying chore a bit easier, or making her workspace more beautiful and fun. I hope you find these ideas helpful and would love for you to share other gift ideas you have in the comments! Big-Ticket Items: These suggestions could be the main gift for a significant other or close friend or family member. Away Luggage (Pictured: The Carry-On Size in Frost, $225): You may have seen Away luggage advertised on social media and I have to say it lives up to the advertising! I have both the smaller carry-on size (pictured) and the "Medium" size and love them both. You can read the specs on the website, but they are well designed bag that are super easy to pack and organize. The carry-on sizes also have a built-in charger. At first I thought that feature was a little gimmicky, but it turned out to be a lifesaver on a recent trip I took. If you know a woman whose job involves frequent travel, then this bag is a great way to help make her life a little easier. Bose QuietComfort 20 Acoustic Noise Cancelling Headphones (Apple devices in white, $299.97; Other devices in white, $235.00): You won't believe what these headphones can do until you put them on--they neutralize airplane engine noise and make people talking at the same table as you sound like they are in another room! I have these headphones and love to use them when I'm traveling, but they would also be awesome for someone that works in a cubicle or in an open office but needs quiet to think. Just make sure you get the right version for her device! Aurate Gold Bar Necklace (14k Yellow Gold, $250): Now for something a little less practical--I love the simple elegance of this chic bar necklace. For those who work in conservative environments, it would look lovely with a button-up shirt and suit, and for those who work in more creative environments, it would be a great piece for layering. Stella & Dot Sutton Necklace (Pictured: Mixed Metal; $128): This is an awesome necklace for any professional lady due to its versatility. I have this necklace in silver and can attest to the fact that each of the five ways it can be worn look beautiful! Since the necklace is so versatile, it goes with many different work outfits and would be an awesome gift for a woman who is just starting to build her work wardrobe or who is ready to up her style ante. Thoughtful Gifts: These items are all under $150--perfect for a friend or relative! J.Crew Heather Camel Cape Scarf ($75 (but J.Crew is always having sales, to keep an eye out! )): I have a similar cape scarf from J.Crew in black, cream and grey and I LOVE it! It can be worn as an oversize scarf with a coat or as a simple cape. It's AWESOME for the office because when it feels like an icebox, I can throw on this scarf and stay toasty. It's better than a normal scarf or blanket because the arm holes keep it from constantly sliding off my shoulders. Seems simple, but makes a big difference! I also love this camel color--it would go with almost any coat and is soft and feminine. Silk Flowers (Pictured: Jane Seymour Botanicals Rose Silk Flower Bouquet in Mint Julep Cup from Hayneedle; $61.10): This item gets to the "beautify" element of this gift guide. So few women invest in making their office or workspace attractive because it seems much more important (and fun, frankly) to decorate your home, but professional women spend almost as many waking hours at their desks! Why not incorporate some beauty there?? I love the idea of silk flowers for the office because they require no maintenance but will still bring some organic beauty to the workspace. Of course, if you think your recipient would enjoy it and be able to care for it, definitely consider giving her a beautiful indoor plant! I have this variety in my office and love it (although I'm not always the best at remembering to water...). Diffuser (Pictured: NEST Fragrances Reed Diffuser - Cedar Leaf & Lavender, 5.9 fl. oz. ; $44.00): This is a wonderful gift for someone who loves burning candles or aromatherapy. While candles are probably not appropriate for most offices, a diffuser is definitely less intrusive, but could bring some peace and calm to your recipient's office. Just be sure to pick out a scent that isn't too controversial or strong--soft florals are probably the safest bet. Stylish Picture Frame (With a Picture!) (Pictured: Kendra Scott Filigree Picture Frame in Gold, 4"x6"; $75): A beautiful picture frame with a meaningful photograph inside is a wonderful gift because it both beautifies the office and reminds the recipient of pleasant memories on not-so-pleasant days. Of course, you can find frames at any price point, but I love this Kendra Scott version. Stocking Stuffers: Each of these items is under $30--perfect for a stocking stuffer or a Secret Santa. College Pennant (Pictured: University of Notre Dame; $28.00): If your recipient is proud of her alma mater, then a college pennant or other piece of school memorabilia can celebrate it in a more fun and colorful way than displaying a diploma. I have the pennant pictured above hanging on my bulletin board, and it's a great conversation starter when meeting new colleagues or interviewing candidates. Steamer (Pictured: JOY 900-Watt Supreme Steam My Little Steamer and Bag; $19.95): Okay, so I realize that this suggestion and the next one are possibly the most practical and least romantic gifts in existence, but hear me out! Every busy professional woman should have a steamer, but very few do! They are such a time saver because they can be used while clothes are still on the hanger (no need to set up an ironing board) and can help extend the life of an item between dry cleaning by freshening items up a bit. They ALSO can be used on delicate fabrics that can't easily be ironed, so silk shirts and synthetics will always look lovely and smooth. While your recipient might laugh when she received this gift, I PROMISE she will love it and think of you fondly whenever she pulls it out in the morning! Retractable Lint Roller (Pictured: Flint Metallic in Copper; $9.99): Keeping with the uber practical theme is this retractable and reusable lint roller. As someone who lives with a dog, I often do the once-over in the mirror in the morning, realize that I really should run the lint roller over my outfit, can't remember where it is and don't have time to look, and leave the house in a rush cursing the day I ever dared to purchase a black item of clothing. A little retractable lint roller can be kept in a purse or a desk drawer, so you always know where it is and can use in en route to or upon arrival at the office. If your recipient has pets, this roller would be a great little gift. Fun Office Supplies (Pictured: Kate Spade "Strike Gold" Stapler; $28; Treshold Gold Owl Push Pins; $3.99; Luxye Set of 6 Gold Pens; $15.99): If you work at a company that provides free office supplies, then spending money on custom items, no matter how stylish, can seem a bit frivolous (although I will admit that I have pretty much the entire Kate Spade "Strike Gold" set at my desk at work...), but they can be yet another way to add a little fun into the work day. I love using my set of gold pens; they give me a little confidence boost when I bring them to meetings. If your friend's style is a little more colorful than glam, then you should also check out the brightly colored items at the Poppin website. Custom Foil Sign (Pictured: 8x10; $25): These foil signs would look so lovely posted on a bulletin board or framed on an office desk. I actually have two signs on my desk that I received as gifts and I love them! These custom versions also allow you to thoughtfully select a personal saying, whether a favorite quote, a little prayer, or an inside joke, and will put a smile on your recipient's face every time she sees it. This website also has pre-designed sayings that would be great for the office (I especially love "Good things come to those who hustle"), so take a look!